The web site audit should be performed as soon as the web pages are posted for public viewing, thus avoiding any regulatory criticism. The Initial Web Site Audit is performed to ensure that the site is compliant with federal Internet laws. Yennik, Inc. will issue you a "Username" and "Password" for access to "Web Site Audits Client Only" web site. This special web site contains valuable information and recommendations regarding Internet compliance with federal laws and regulations. We will also pass along information from our clients about what the examiners are actually requiring on a web site when conducting a web site examination. 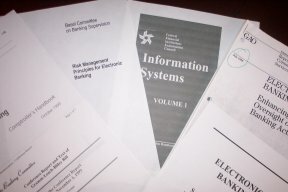 The audit follows the FFIEC Internet guidelines. We will start the audit of your web site, which is conducted from our corporate office. We use Internet Explorer and Netscape Communicator to view the web site. During the audit, we will be in continuous contact with the institution by telephone or e-mail. While auditing your web site, we will be observant to loading time, broken links, site flow, design issues or problems, and issue a written report entitled "Other Web Site Comments" in addition to the Initial Web Site Audit Report. If you elect, we will test e-mail addresses and forms. We verify weblinks for functionality and appropriateness. When the web site audit is completed, which takes about two weeks, we will e-mail you a draft of the "Initial Web Site Audit Report" and "Other Web Site Comments." The "Web Site Audit Report" and "Other Web Site Comments" are written with the hyperlink for each web page in question. This allows you to easily go to each web page and view the issue in question. After you have had time to review the web pages in question, we will discuss the reports and the various issues regarding each web page. We will also discuss the various ways to make any necessary corrections. At this time, if you are not satisfied with the initial audit for any reason, you will owe us nothing. We will then issue the final "Initial Web Site Audit Report" and "Other Web Site Comments" report. If your web site is not compliant, we will conduct a follow-up audit regarding the "Initial Web Site Audit Report" within 30 days at no additional charge.